Oaxis has launched a new crowdfunding campaign on Kickstarter for a new InkCase that fits the iPhone 7 Plus. Oaxis sells a number of different products, including several smartphone cases with E Ink screens built into the back. 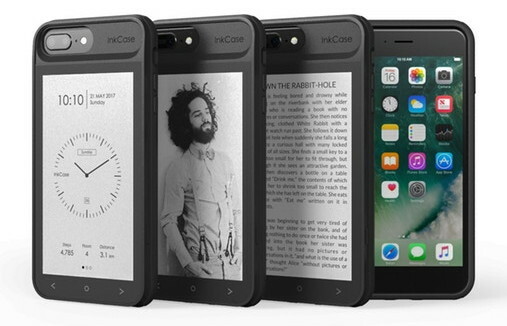 Their latest new InkCase for the iPhone 7 Plus features a sizeable 5.2-inch E Ink screen. It uses Carta technology and it has a resolution of 540 x 960 (that’s 217 ppi). A 5.2-inch E Ink screen sounds pretty large but it’s still quite a bit smaller than a 6-inch Kindle because the screen ratio makes it seem a lot narrower. The case has Bluetooth to connect to the iPhone through an app. The case is also waterproof and shock resistant. Battery life is estimated at up to 5 days with the built-in battery for the E Ink screen. The InkCase i7 Plus is expected to start shipping in July. Pledges start at $123 plus shipping on Kickstarter. The $69 pledge for the InkCase IVY for iPhone 7 makes no sense. First off, shipping costs extra and the delivery estimate isn’t until August. Second, they’re selling them right now on Amazon for $49 with free shipping. The InkCase IVY has tiny E Ink screen though so it wouldn’t be useful for reading. The video below is a review of the InkCase i7 for the regular iPhone 7, not the Plus version, but it’ll give you the gist of how it works.